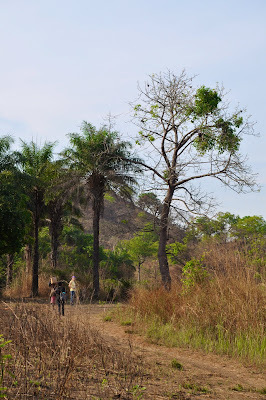 During the recent trip to Sierra Leone, we were delighted to be able to return to Kamasorie Village. This village requires about a 45 minute drive from the area where the new NHA Compound is and then a 4.8 mile hike by trail. The sign at the entrance says 3 miles, but according to GPS it is indeed 4.8 miles from the road to the village. James told me the 'lesser distance' on the sign might be to encourage people to visit, thinking it to be a shorter hike. to navigate through the brush along the trail. I am honored to be given such a precious memento from the past. 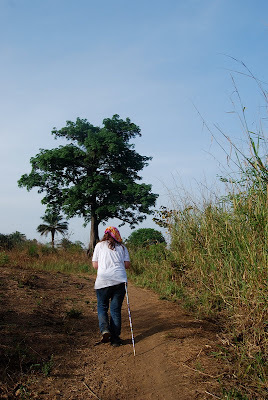 As we hike on, James sees that I am using the cane and recognizes it. He tells me stories about his grandpa - swatting at the kids with the cane when they troubled him or pestered him. we gather the supplies we are bringing in. 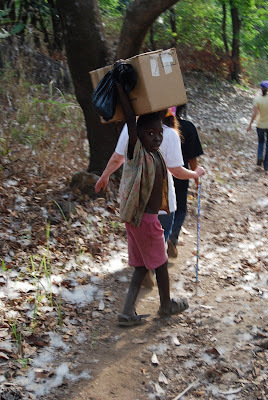 Mako and several of the kids carry the shoes we have brought for the children of the village. I am stunned that they effortlessly carry such heavy loads, long distances, on their heads. but for now it remains an accomplishment this white girl has not met. 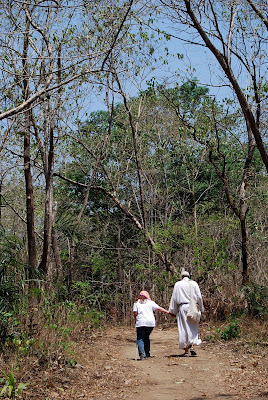 As we hike on into the village, it is a tradition that Fr. Seraphim lags back in prayer. He wants to take his time and pray. Prayers left like bread crumbs every step of the way, lingering for all who pass through this trail to receive. Fr. Seraphim's work is of all time and is not restricted by the clock. 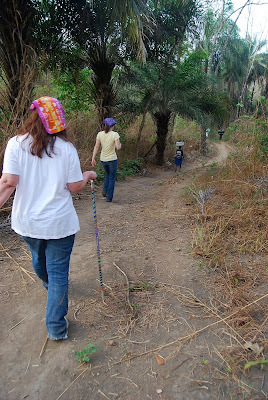 The rest of us, some with loads on our heads, work our way through the trail a bit faster so that we can begin our work in the village while it is still in the cool of the morning. 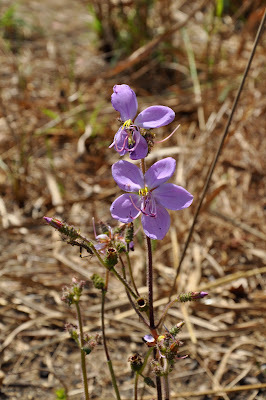 It is March and this is the dry time. 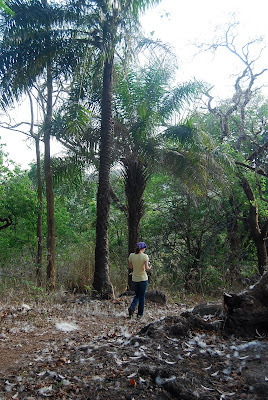 We are used to making this journey in September or October (the rainy season) when all is lush and green. This hike, everything is very dry and it all looks "burned up". and the ponds are muddy with only small amounts of water in them . As we climb up one hill, it looks as if it has snowed. and showered a white fluffy seed mix all over the area. we can view the huts from a distance. A little further in, we see their thatched school. Once we have paid for our new compound in Kabala, including the surrounding land, maybe we can think about building a school for Kamasorie. We've always brought medical supplies into Kamasorie, however, this visit we are bringing shoes as well as enough internal parasite (worm medicine) to treat the whole village. Maybe with our move into Kabala, we can begin to help in their educational needs, also. Finally, we are nearing the village. Fr. Seraphim is not far behind. and prayers as they keep us. respecting each others traditions, working together in brotherhood. At the entrance to Kamasorie, Pa Foday's father, Pa Mako Mansaray, is buried. 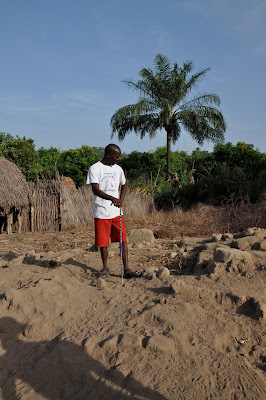 I hand Pa Mako's cane to his namesake, Mako Mansaray as he stands at the gravesite. As the greetings continue, we prepare for our work. Check back tomorrow to hear more about our visit to Kamasorie.